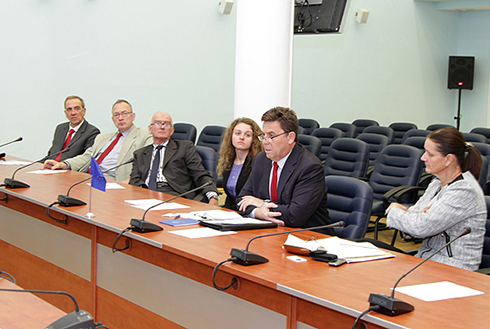 On Friday 3 October European Union Advisory Mission (EUAM) Strategic Advisors assigned to the Ukrainian Ministry of Internal Affairs were introduced to senior Ministry officials. The event was held to launch the process of advising and supporting the Ukrainian authorities in the reform of the Ministry as part of a national comprehensive reform of the civilian security service sector. Ministry participants included the Head of the State Traffic Police Inspection Department, Deputy Chief of the Main Headquarters Inspectorate, Deputy Head of the Ministers Strategic Analysis Department and Deputy Head of the Experts Council. Further events are forecast as more EUAM strategic advisors from across the European Union arrive in Kyiv in the weeks to come. The non-executive mission that works with the civilian security sector has been mandated by the EU Member States to assist the Ukrainian authorities develop and implement major reform processes of the state law enforcement, judiciary and other bodies with EU standards. The mission has an initial mandate of two years.